William Douglas was a successful merchant and military leader who settled in North Branford just prior to the Revolutionary War. Despite retiring with substantial wealth acquired through trade with partners in the West Indies, Douglas sacrificed most of his fortune, as well as his health, in service to his country. Born in Plainfield, Connecticut, on January 27, 1742, William Douglas entered military service as a teenager—seeing his first action during the French and Indian War at the age of 16. He served under Israel Putnam and took part in the expedition that captured the city of Quebec in 1759. After the war, Douglas moved to New Haven and became the commander of a merchant ship that sailed between New Haven and the West Indies. His success as a merchant allowed him to accumulate enough wealth to purchase 150 acres of farmland in Northford (now a part of North Branford) and settle into a quiet life there in 1772. 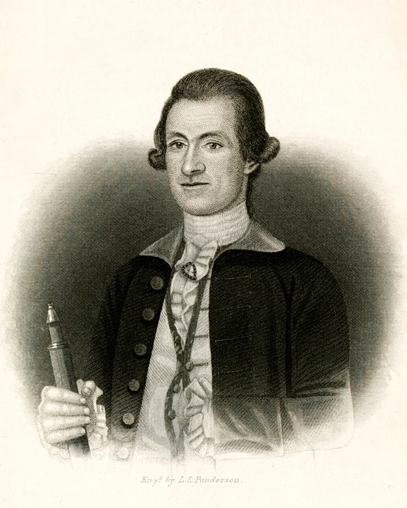 Douglas re-entered military service, however, with the outbreak of the Revolutionary War. He served under Ethan Allen in the expedition that took Fort Ticonderoga from the British. He then raised a military company in New Haven in the spring of 1775 before being given command of a flotilla on Lake Champlain meant to deter a British attack from Canada. While serving on the lake, Douglas led a raid on St. John (known today as St. Jean) that captured large stores of provisions eventually used in the defense of Boston. After returning to Connecticut for the winter, he was about to begin a political career (having been elected to the Connecticut General Assembly) when the Connecticut legislature offered him a commission as a colonel of a battalion sent to help defend the island of Manhattan. Douglas served in New York under George Washington, fighting in such famous battles as Harlem Heights and White Plains. With the closing of the 1776 campaign, Douglas returned to his farm in Northford to recuperate. Months of endless battles and exposure to the elements caused him to lose his voice (which never fully returned) and brought on serious illness. Having often used personal funds to aid in the colonial cause, Douglas found himself in dire financial circumstances in the months leading up to his death. He sold his property in New Haven but received payment in continental dollars, a currency that became virtually worthless. Despite his intentions to return to military service in the spring, Douglas succumbed to illness on May 28, 1777, at the age of 35. By the time of his passing, most of the fortune he acquired as a merchant was gone.